Happy Feature Friday, everyone! Say hello to Raluca Gheorghiu Boac, an alumni of our Graduate Program and a Romanian-born pianist who loves to share Romanian piano music with Minnesota! 1 day 11 hours ago. Congratulations to our current horn professor, Mike Alexander, on being named the Principal Horn Player of the Minnesota Opera Orchestra! 2 days 9 hours ago. See what Holly Brown has to say about St. Thomas Music! 4 days 11 hours ago. Congratulations to Dr. Bryan and Dr. Kachian on their years of dedicated service to the University of St. Thomas Music Department! Next time you see them, make sure to congratulate them and thank them for their years of service! 5 days 10 hours ago. Happy Feature Friday, everyone! Say hello to Matt Wilson, an alumni of our program! Matt is currently finishing up his last semester of Law School and will soon be taking the bar exam. Good luck on the bar Matt! 1 week 1 day ago. 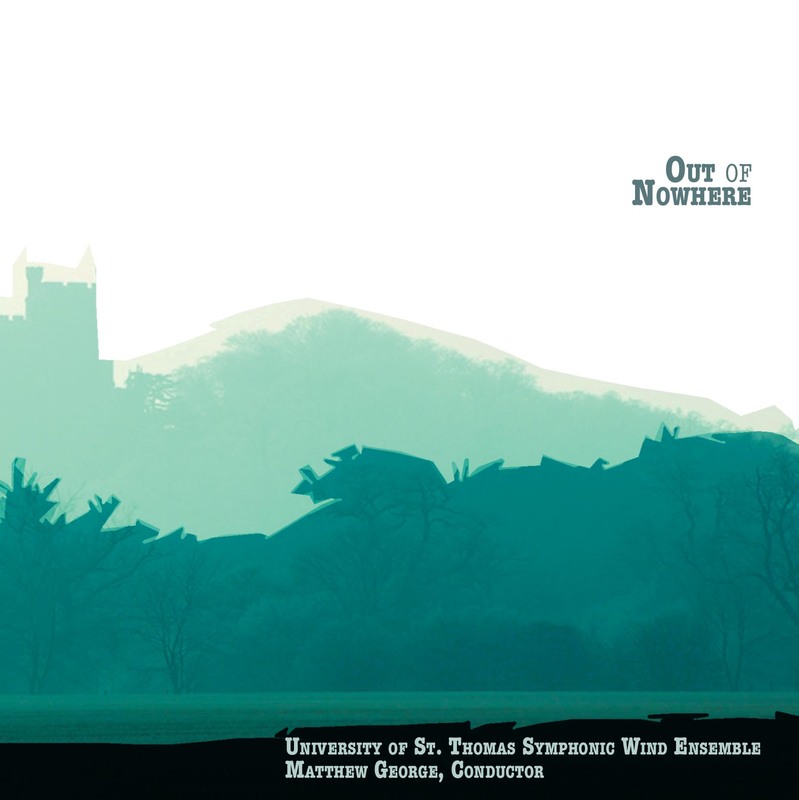 As a title, “Out of Nowhere” is typically self-deprecating; the UST Symphonic Wind Ensemble in fact heralds from St. Paul, Minnesota and is, indeed, recognized as one of the finest bands in the field. Continuing its project of recording music from the vast commissions the ensemble has accrued, this album (the second in its innova series) represents some of the finest wind band music from England, Germany and Armenia. From the starting gate, “Infernal Ride” is a fearsomely virtuosic work that barely eases up at the end. British composer Kenneth Hesketh compares it to Ichabod Crane’s final ride in Irving’s story “The Legend of Sleepy Hollow”. The title track “Out of Nowhere” by German Rolf Rudin sets out to tell the Irish mythical tale of an ancient kingdom coming to Ireland from the heavens to rule for generations. The work draws the listener into the story of mystery, magic, love, and war. “Mass of St. Thomas Aquinas” by renowned British composer Martin Ellerby combines the forces of the symphonic wind ensemble with a vocal ensemble. The result is a multi movement work of intense color, emotion and sparkle. Another well-known British composer in the wind band world is Philip Sparke. His “Deserts” is a musical evocation of a desert - it could be sand, ice or extra-terrestrial - and explores the paradox of danger combined with awesome natural beauty. Armenian composer Loris Chobanian has written “Armenian Rhapsody” for the unusual combo of solo guitar and wind band. It is not your typical folk song arrangement; rather it combines many fragments of Armenian folk tunes under different themes. The UST Symphonic Wind Ensemble is again under the direction of Matthew George. “Out of Nowhere”, like the ensemble, is going places. Kenneth Hesketh’s Infernal Ride is a solid piece for a band. It, like many pieces for wind ensemble, starts with a bang, keeps a very steady pulse, calls attention to a few instruments, then varies the colors and timbres before mallet percussion and John Williams (think Star Wars) brass flourishes conclude. Rolf Rudin’s Out of Nowhere uses rising accompaniment over steady moving low winds to create a sense of fluid motion. The middle section, surrounded by mystical bell trees on both sides, brings the oboe, flute, and clarinets as the requisite emotional melody reaches for heart strings. A swirling mass of brass interrupts the somber reflection but then dissipates back to nothing. Loris Chobanian’s Armenian Rhapsody comprises both a festival and a dance movement. The moments where the guitar gets to the festival are pleasing, but I found myself wishing the peppy wind ensemble sections were not as over-the-top and reflected the musical ideas played in the guitar more delicately in the dance.